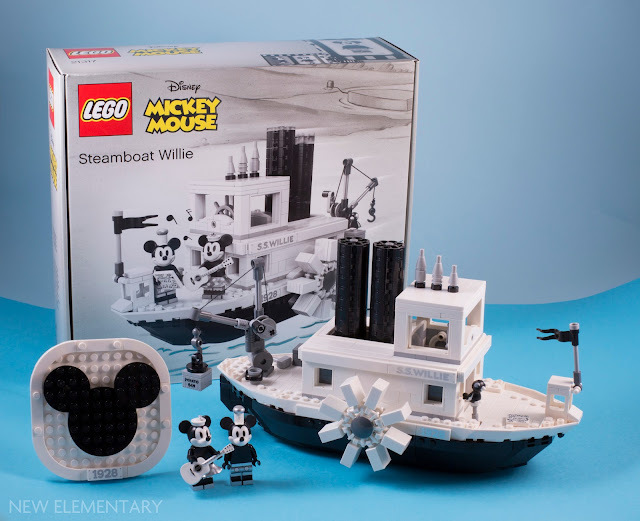 The next LEGO® Ideas set, 21317 Steamboat Willie, marks the 90th anniversary of the most famous cartoon character ever, Mickey Mouse. His fame was sparked in the 1928 black-and-white animated short film called Steamboat Willie which was also the first Disney film to have synchronized sound. Let's steam ahead with Mickey and take a look at the set that will be available from 1st April 2019 priced US $89.99/CA $119.99/DE €89.99/UK £79.99 and contains 751 parts. 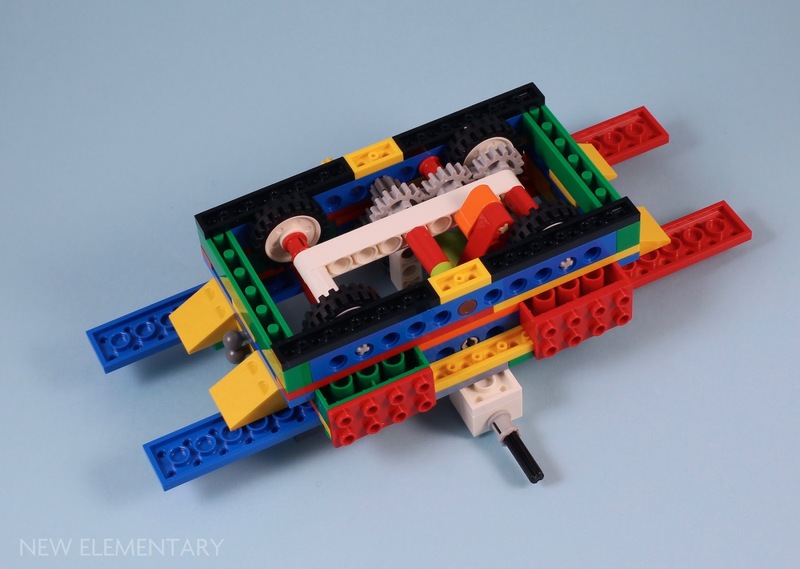 The original LEGO Ideas proposal was submitted in 2016 by Máté Szabó who lives in Budapest and is an animator. The proposal hit the 10k votes mark in July last year and it was only revealed that the proposal would become a set last month when the review results were announced. Clearly a lot has been going on behind the scenes as the set has evolved into a larger, functional, impressive version of the original proposal. Let's take a closer look. 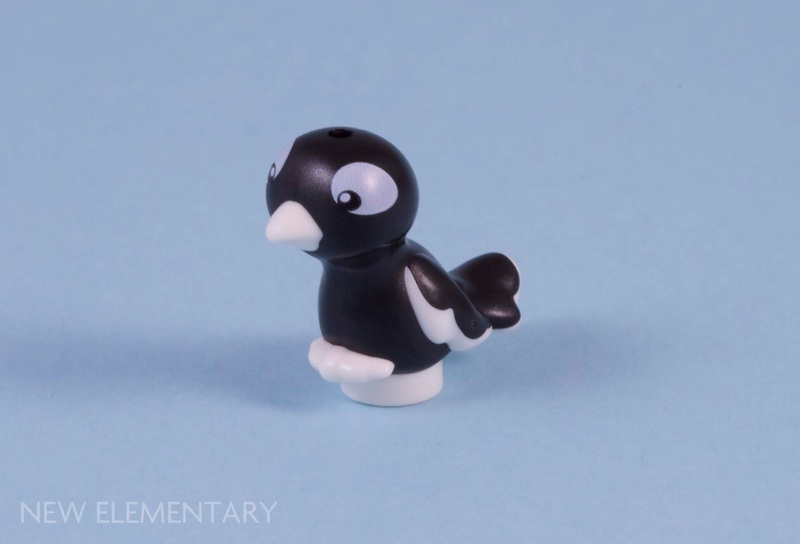 In an unusual move for us here at New Elementary, we are going to take a look at the minifigures and their accessories first. 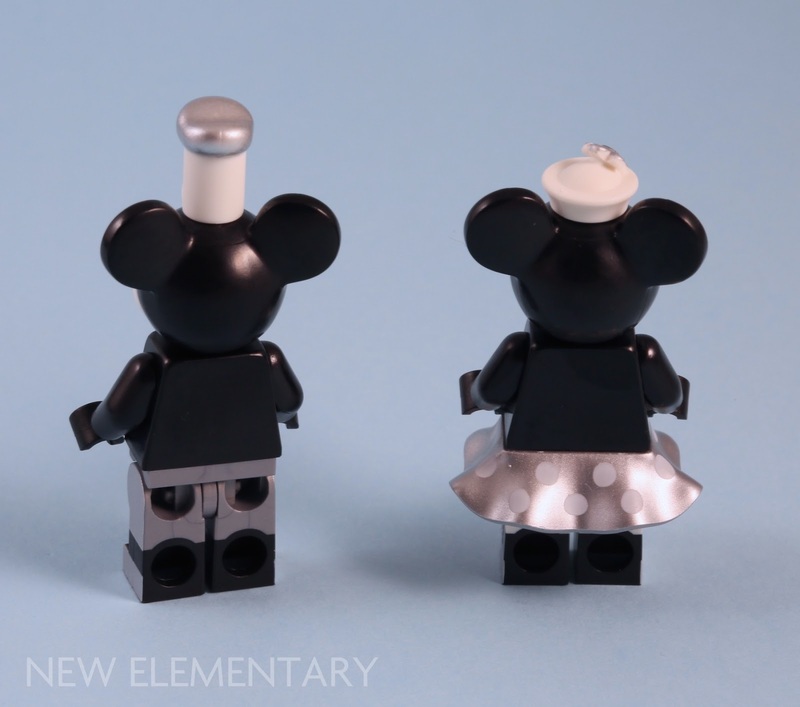 Unlike the original submission, both Mickey and Minnie are included in the set and a similar in general appearance to their CMF counterparts. You will note that they have white faces and their eyes are different as both have simple Black eyes and in a weird, spooky manner they have no pupils although the heads are not new moulds. "Sometimes we have options to do things to improve our products (especially to meet the standards of our IP partners)"
So I guess what Disney want, Disney get! 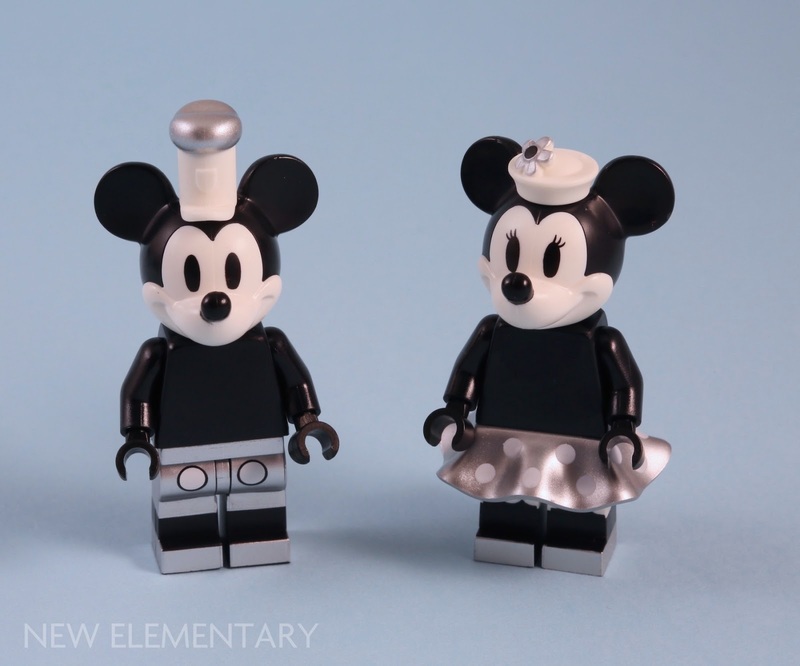 Mickey and Minnie are wearing hats that are completely new elements. White 'Mickey' Hat (Element ID 6273916 | Design ID 44553) is a cap with a Metallic Silver top and White 'Minnie' Hat (Element ID 6273932) has a small Metallic Silver 5-petal flower. Both attach via a 1.5mm bar. My set had an extra Minnie hat. 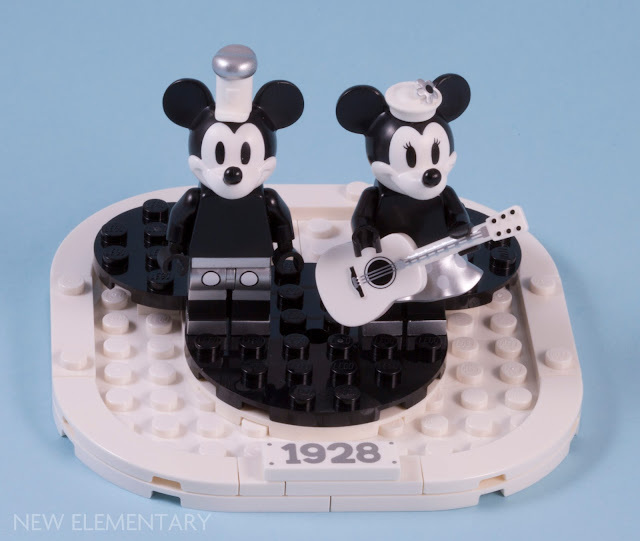 "The most challenging part was to make the Mickey and Minnie minifigures really stand out since they are the main characters. I decided to add some extra vivacity with silver details on their accessories." Although the front and sides of Mickey's legs are Metallic Silver, the back is not and has the Titanium Metallic [TLG]/ Pearl Dark Grey [BL] base colour instead. I thought this looked a little odd but maybe I am being picky as not many legs have back printing or a silver lacquered coating. 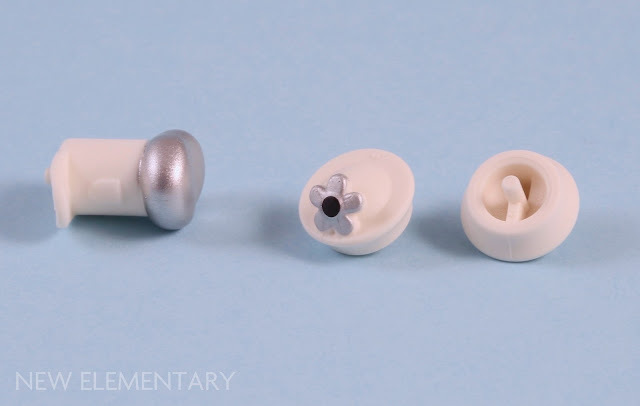 There are two new recoloured minifigure accessories in the set. Firstly, Bird, W/ 1.5 Hole, No. 5 (6274813) appears in Black with White highlights for the first time. This bird has appeared previously in Bright Reddish Violet [TLG]/Magenta [BL], Medium Blue and Flame Yellowish Orange [TLG]/Bright Light Orange [BL] in a variety of Friends and Elves sets. 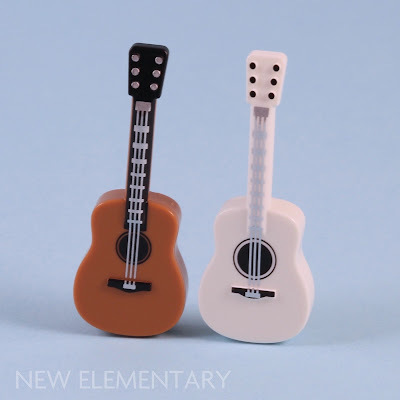 In addition, Minnie's White Mini Guitar No. 3 (6273949|27989) is the same mould as the previous acoustic guitar Medium Nougat [TLG]/ Medium Dark Flesh [BL] Mini Guitar No. 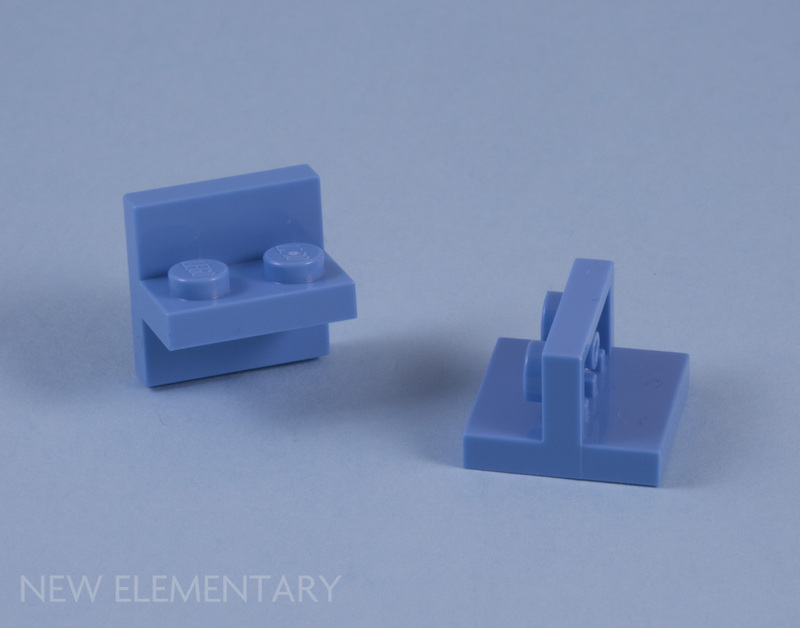 3 (6160320|27989) that appeared in sets like 10255 Assembly Square and was carried by the Mariachi minifigure in CMF Series 16. Medium Stone Grey [TLG]/Light Bluish Grey [BL] Fabuland Ship Wheel (6278555| Design ID 52395) appears in another colour for the first time, this has only ever been available in Reddish Brown (6278548) until now. 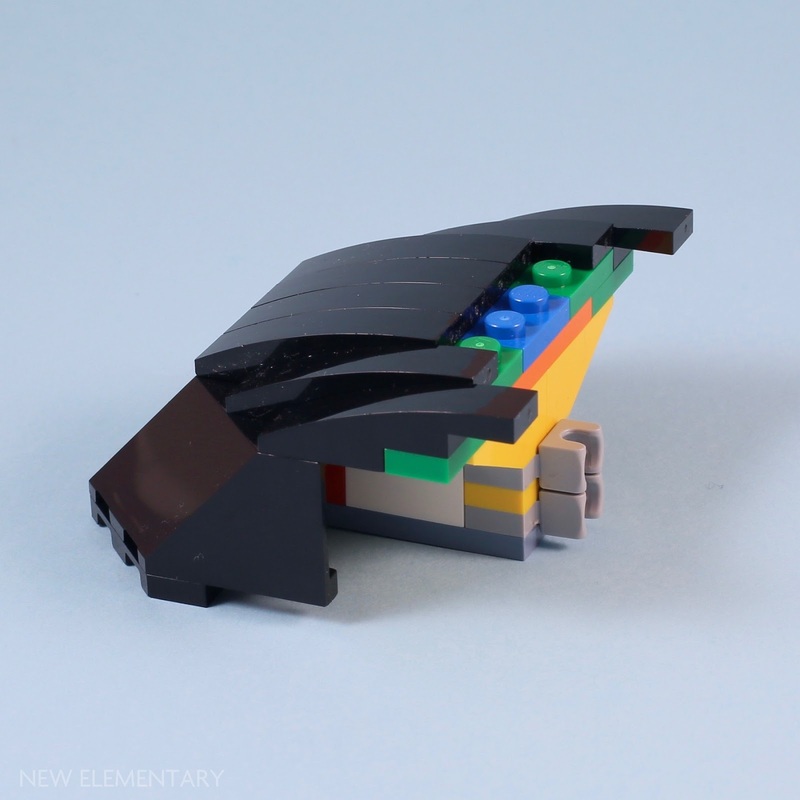 Black Windscreen 8X5X2 (6270816|30741) has only ever appeared in White in two LEGO City sets released in 2016. I would consider this a re-colour of a reasonably rare part in terms of number of appearances. It is put to great use in this set as you will see shortly. 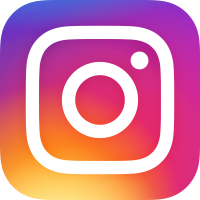 One of my favourite new elements for 2019 appears in another new colour, Medium Blue Plate 1X2 W/ Vert Tube (6271130|41682). That makes seven colours for this element already; Black, White, Dark Stone Grey, Medium Stone Grey, Bright Yellow and Brick Yellow. Dark Azure Brick 1X2 With Cross Hole (6249815|31493) has only appeared in one other set at present, four are included in 21148 Minecraft Steve BigFig with Parrot released in January 2019. 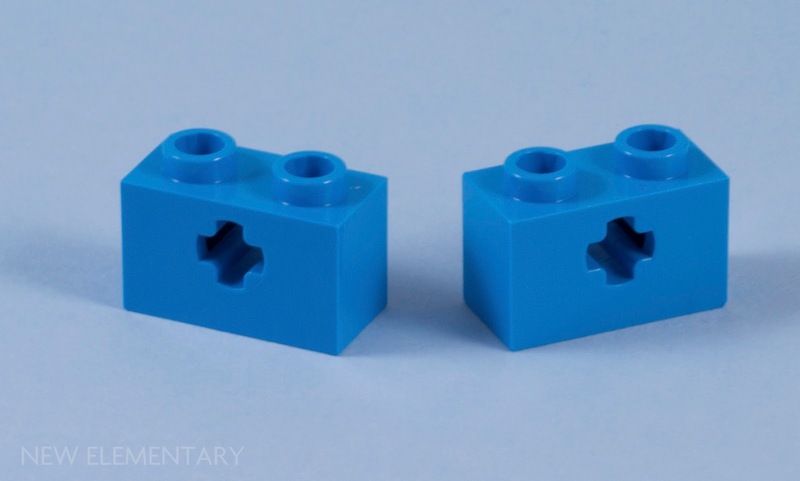 There are two supplied in this set, I always enjoy a sprinkling of azure in any build. Yay there are no stickers in this set! In terms of new printed elements there are four designs. The '1928' and 'S.S. 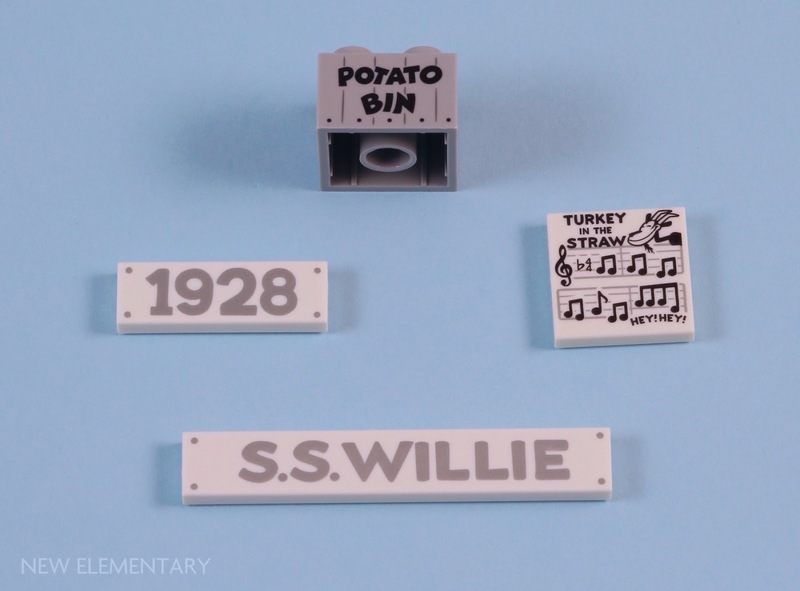 Willie' lettering is Silver Metallic and the 'Potato Bin' brick is printed on opposite sides. The best part of the printed elements is highly detailed 2x2 tile with a couple of stanzas of the sheet music for Turkey in the Straw, music that features in the original cartoon. 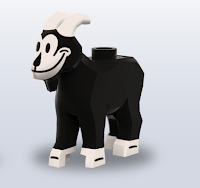 In addition, there's a nod to the fun goat that also appears in the cartoon, but sadly the recoloured goat from the original submission did not come to pass. 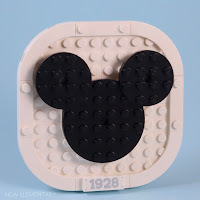 The very first part of the build is a display stand showing the iconic Mickey silhouette and one of the White Tile 1x3 '1928' (6273663) to mark the 90th anniversary (um... last year's 90th anniversary if my maths is correct). 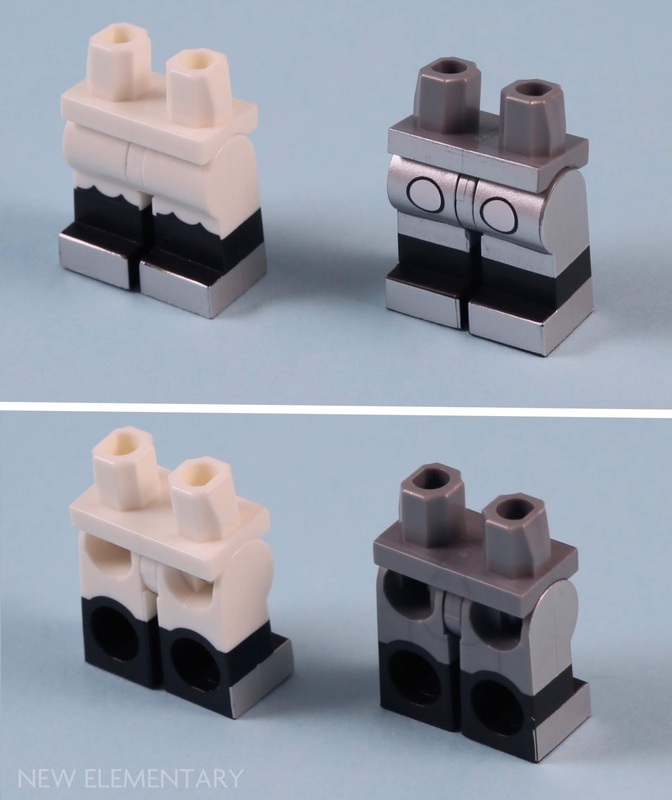 Alternatively, you can remove the feet and make it into a base for your minifigures. 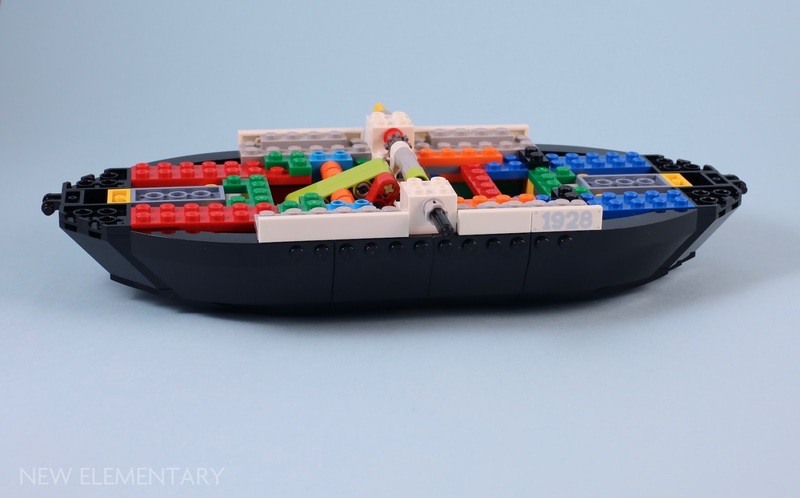 The very first part of the steamboat to be built is the colourful yet functional inner structure of the hull. This contains all the gears, wheels and Technic components that give this set some excellent functional movement and play features. The initial play feature is horizontal movement, something that the original submission did not offer. The base of the boat's hull has four subtly hidden wheels that move as the axle that holds the steamboat's paddle wheel turns. For clarity, I have removed some of the bricks on one side and added the steam wheel to the base to show this function in all its simple splendor. 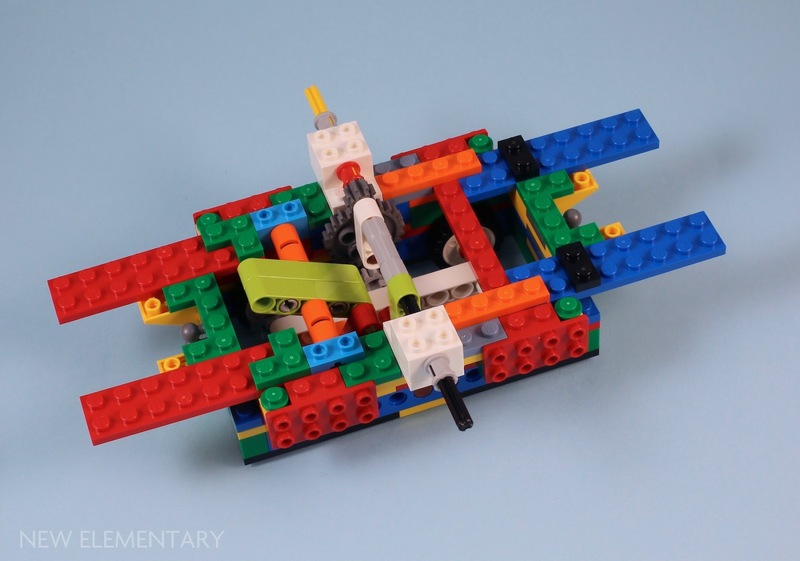 You will notice the Lime Technic 5M Beam (4661486|32316) is also connected to the horizontal motion and provides a vertical tilting action whose function becomes clear later in the build. 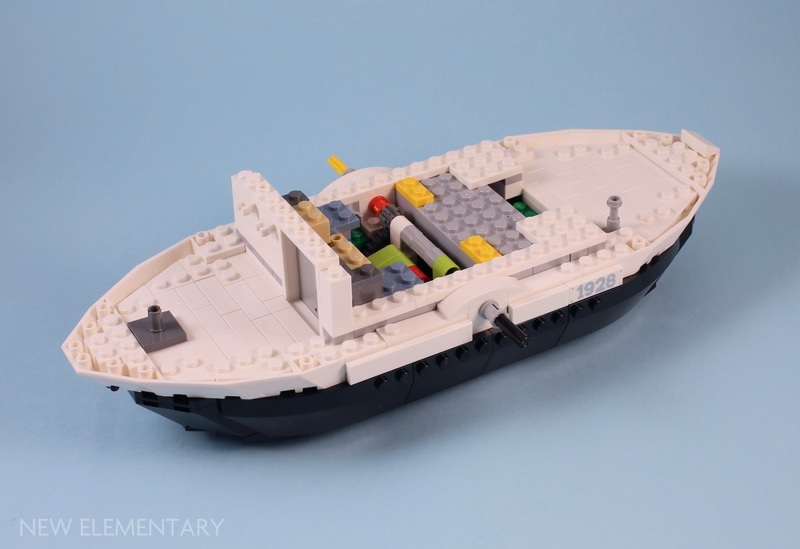 The bow and stern are formed using Black Windscreen 8X5X2 and ingeniously attached to the central portion of the build using Mixel joints. 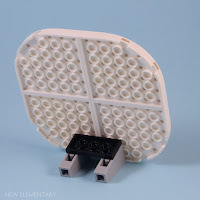 This allows 180 reversal with a very secure connection and works perfectly to give a smooth hull. Once the decking is added almost all signs of the colourful inner workings have vanished to give the monochrome build a clean finish. 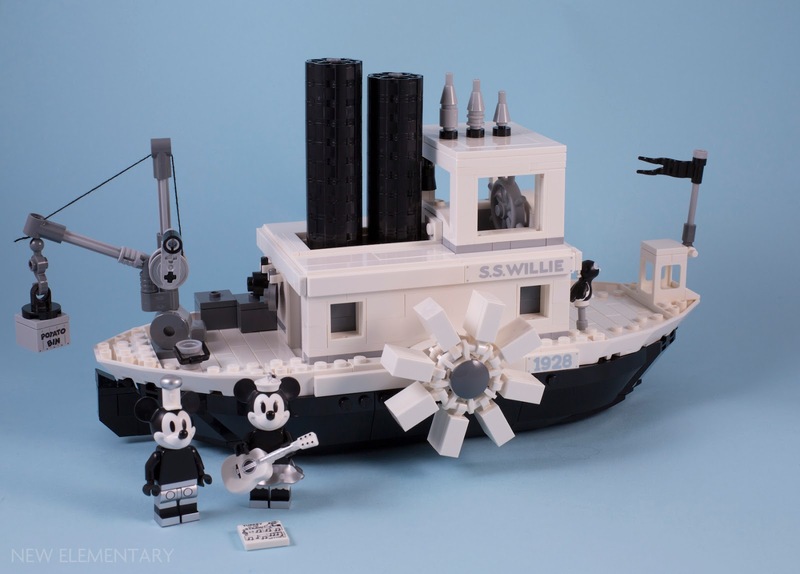 The upper deck and the funnels are next, and the steamboat's paddle wheel of course. 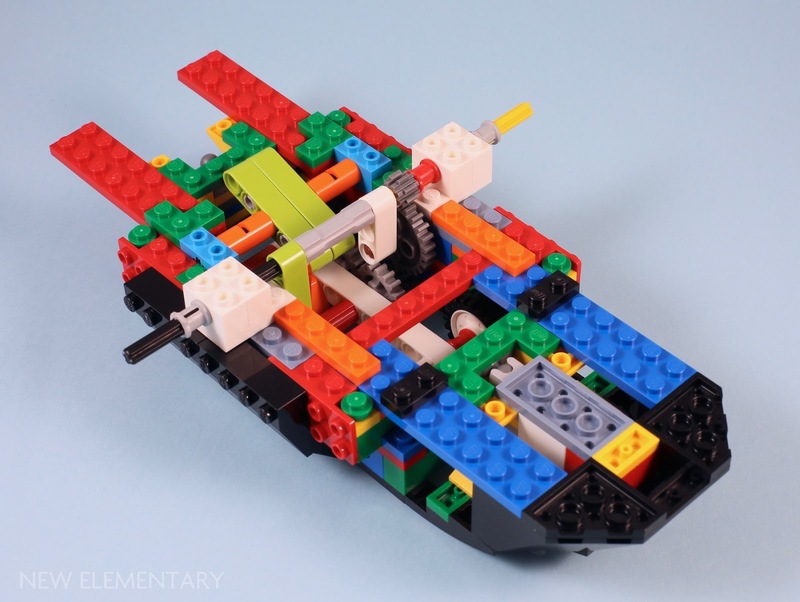 The original submission used the Fabuland Wheel but due to the increased size of the hull, a brick built wheel is now created and fixed into position on the main axle. 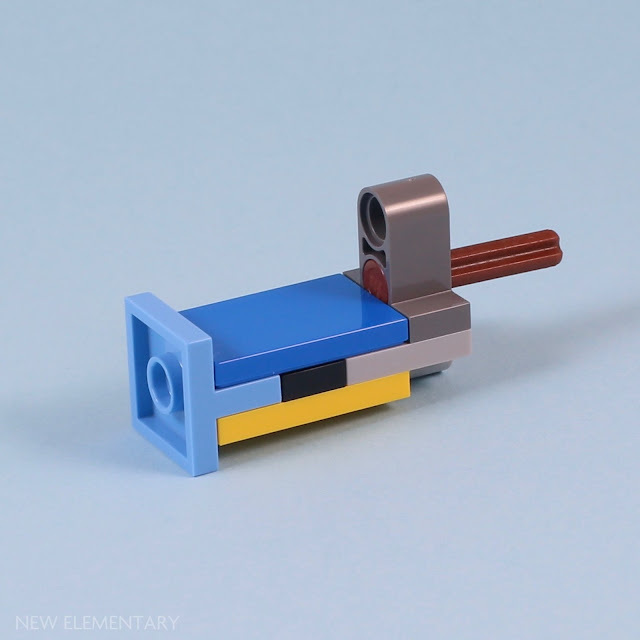 The tilting motion of the Technic 5M Beam is now utilised as two sliding units are built using the fantastic new-for-2019 SNOT element, Medium Blue Plate 1X2 W/ Vert Tube (6271130|41682). 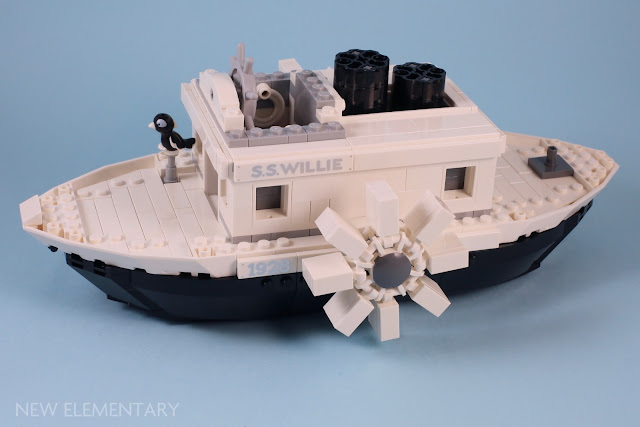 Once the two sliding units are in position, the up-and-down motion of the steamboat's funnels can be seen as the paddle wheel turns - a very nice effect! 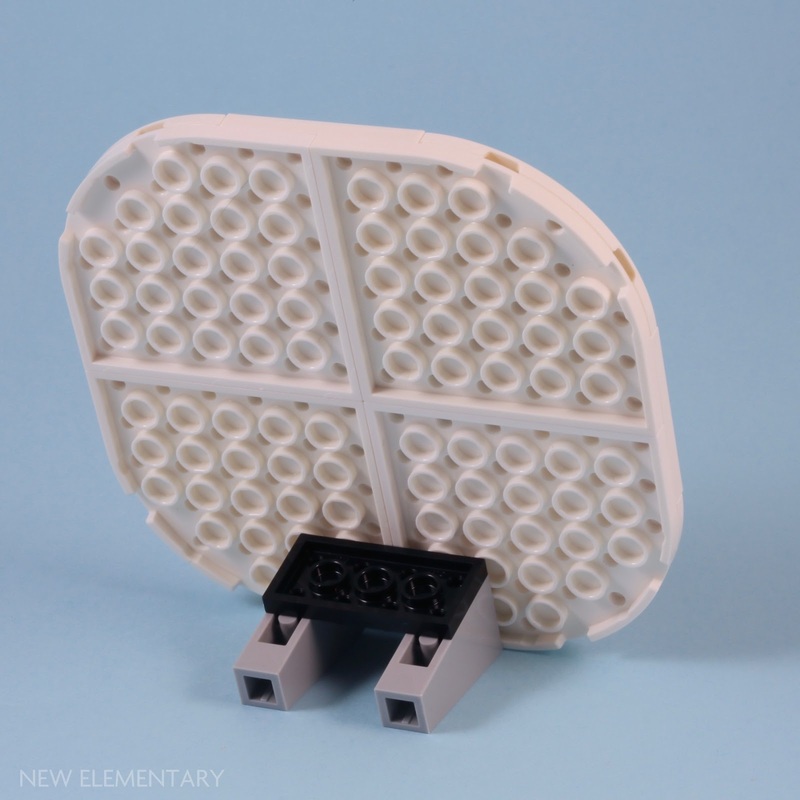 Beware: it is key to ensure that all the elements are firmly connected as even the slightest decrease in space for the sliding movement will stop the funnels from moving smoothly. The cabin section has a few nice touches to make sure there are texture and details despite the mainly White colour scheme. I particularly liked the simple method of using White Frame 1X4X6 'door frame' (6262945|40289) to contain the funnels but allow free movement. The boat’s bridge has space for a minifigure and includes the newly recoloured ship’s wheel and two life buoys. 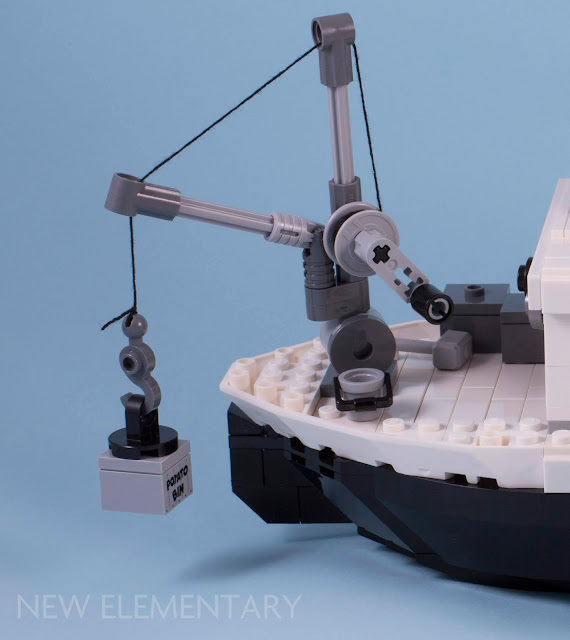 The final stage of the build are some additions to the deck, including the loading crane that can swivel and be raise/lowered and also a turning handle to alter the length of the string to lower cargo from the boat to another location. 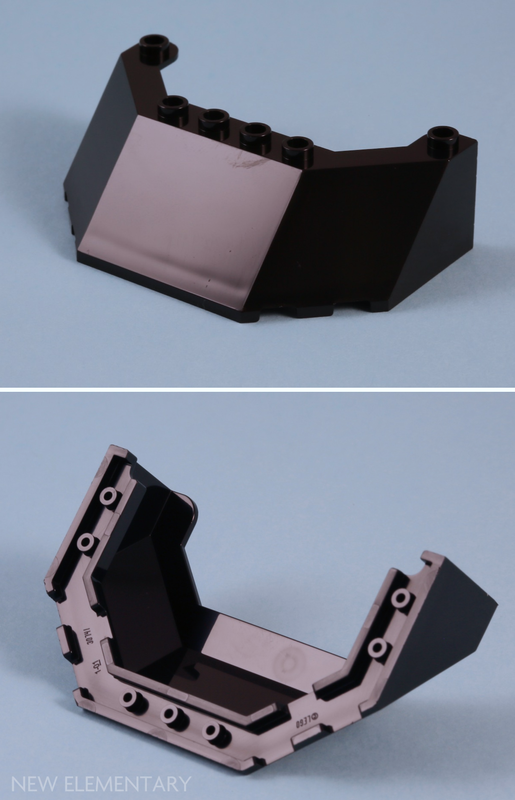 Plus the final stacks of Black Weapon Barrel (6186133|31511) are added as each funnel has 10 of this element. 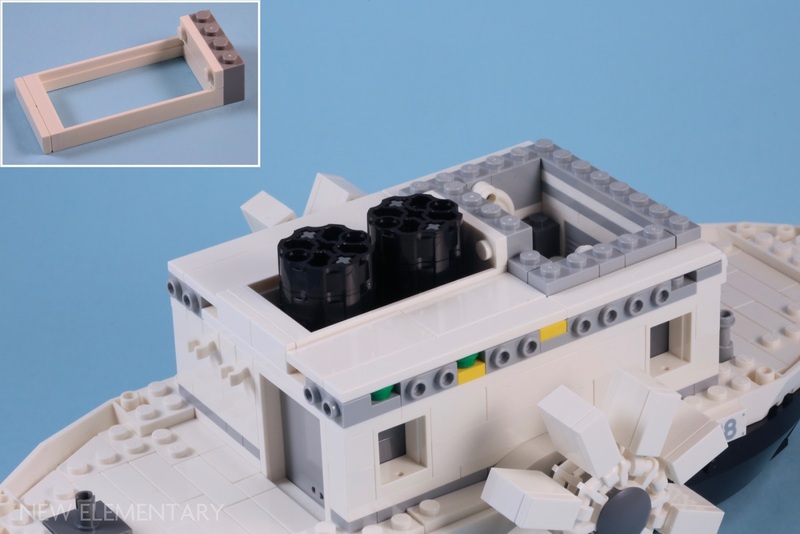 I admit that I was not one of the 10K supporters of the original submission which had less than 200 parts (depending on which of the versions you count). 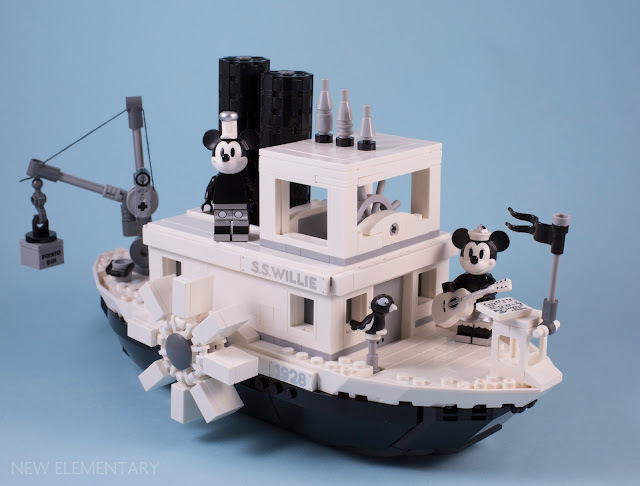 I was not overly impressed with the initial submission nor was the Steamboat Willie theme itself of great interest to me. Clearly LEGO Ideas review team saw the potential as Mickey Mouse is a huge part of the Disney empire and regarded the original submission as a starting point to really go to town with. 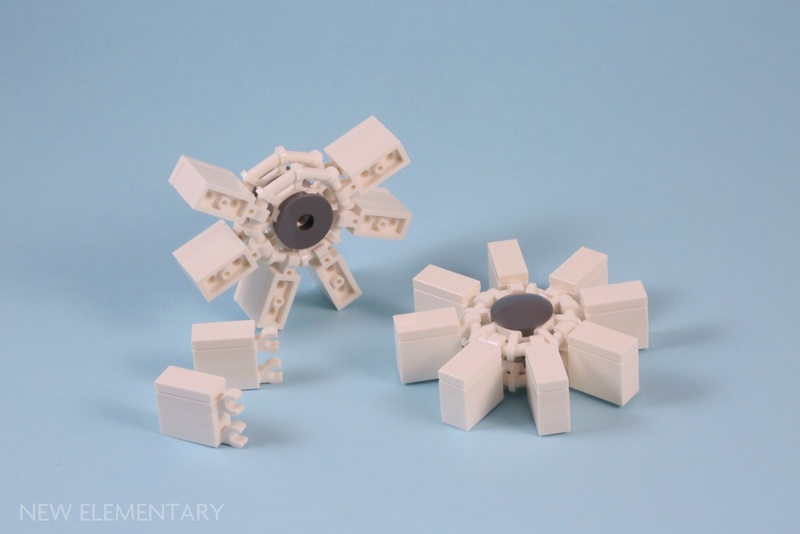 The final set is a far cry from the initial submission with a turning paddle wheel that provides horizontal movement - wouldn't it be fun to mechanise this with some Power Functions! The funnels move up and down in a manner that mimics the original cartoon. The Minnie and Mickey Mouse minifigures have some lovely Silver Metallic printing and come with an anniversary display, so overall a massive improvement that turns a basic idea into a rather impressive set. Would I buy it for £79.99? Well personally the set still doesn't really capture my own interests and there is not enough here for someone who loves new elements and pretty colours. I missed colours, so sadly I don't think the black-and-white colour scheme is for me but it is a fine looking set. Having said that, there are plenty of Disney fans out there and many more will appreciate the effort to improve upon the submission and make a very nice memento of a famous mouse and his cartoon history. Help New Elementary keep publishing articles like this. Thanks to our 'Vibrant Coral' patrons: Kevin Gascoigne, Sue Ann Barber and Trevor Clark, Nick Savage, Beyond the Brick. You're all awesome! You can also help us by doing what you perhaps do already - buying from Amazon. Thanks for pointing out the actual plastic colour(s) of Mickey's legs (as opposed to just the printing), and the photos clearly showing them. I am impressed by the inverted build of the bow and stern. 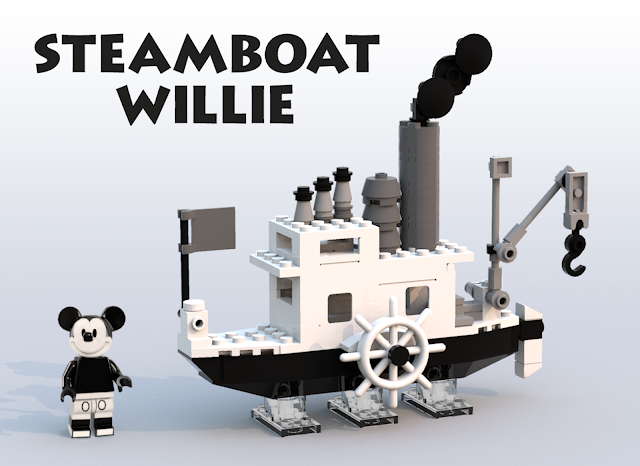 I will be adapting that for a MOC I am planning. Thanks for the detailed review! LEGO® Gears: from Samsonite to splat!